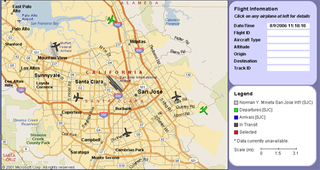 Reader Michael sent in this link to some web-based Java airport monitoring app. Just go to the site, pick an airport, and see a real-time display on planes flying in and out of your local hub. So far only major airports like Boston Logan International, LaGuardia, LAX, and my local San Jose International airport have plane tracking up. Pretty sweet app nonetheless.